Life Model 2 — studio. smart giant. Concept and art direction for David Shrigley's Life Model II exhibition as part of Brighton Festival 2018. Shown at Fabrica Gallery, Brighton, UK April - May 2018.
the inevitable breakdown in representation between imitation and imagination. The design utilises his Shrigley's own handwritten typeface and reflects the branding of Brighton Festival 2018 and his role as Guest Director. 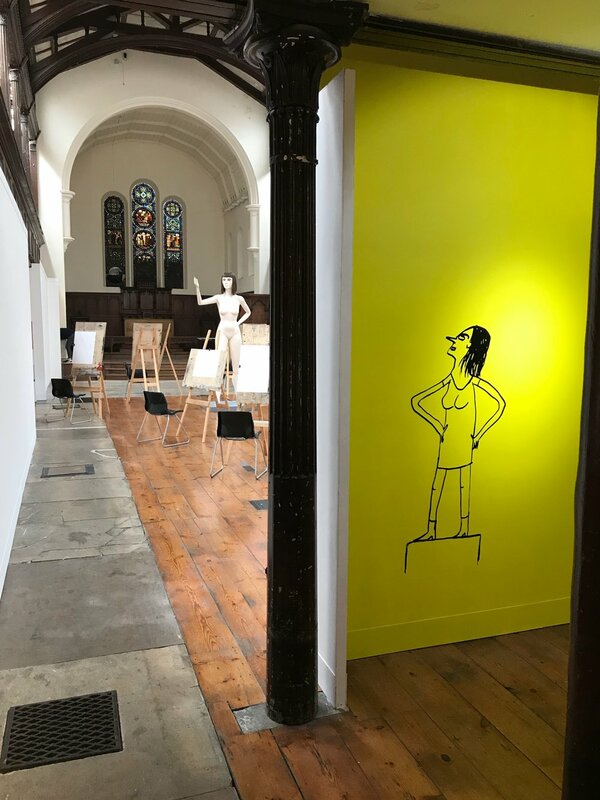 Extrapolating a drawing of a model from one of existing works allows the print materials and wall graphics to directly show the playfulness of the work and allows viewers - especially children - to instantly connect with Shrigley's own distinctive style. The Shrigley typeface is paired with a round sans-serif typeface to increase readability (thus allowing the information to be as accessible as possible) but keep the lightness of touch that informs the work. Each guide features 2 works by David Shrigley allowing gallery visitors a nice memento of their time with his work.